Microsoft Office 2000 Professional gives you new ways to access, view, and share information for smarter decision making. Here are six key productivity tools, integrated and easy to use. So whether you're looking at the big picture or managing your day-to-day tasks, Office Professional will help you get the job done!! 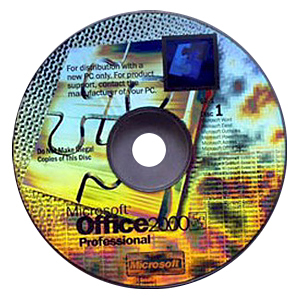 Includes 2 Microsoft Office 2000 Professional Edition w/Publisher SR-1 Edge-to-Edge Hologram OEM CD's with a key code on a generic white sticker. The CD's contain an End-User License Agreement. You must agree to it before you will be allowed to complete the installation procedure. Microsoft Word 2000 gives you the word-processing tools needed to easily create professional looking documents and share information - in print or on the Web. Word 2000 embraces HTML as a first-class file format and extends Word's industry-leading ease of use to the Web and e-mail. Microsoft Excel 2000 gives you the spreadsheet capabilities you need to analyze data and find solutions. Excel 2000 delivers new levels of resiliency and intelligence, enabling users and organizations to get up and running quickly, stay working and achieve great results with fewer resources. Microsoft Office 2000 offers enhanced charting and rich analysis tools for creating spreadsheets and sharing information. Microsoft Outlook 2000 is an integrated e-mail and personal information manager, providing e-mail, calendaring, and contact and task management. Microsoft PowerPoint 2000 makes it easy to organize, illustrate, and deliver ideas professionally. Whether users are conducting a meeting, presenting to an audience, or delivering messages over the Internet, PowerPoint 2000 provides the tools necessary to share information and make points effectively. Microsoft Access 2000 makes it easy for users to get the information they need and provides powerful tools that help users make better decisions. Access 2000 let users quickly pull data from spreadsheets and other relational databases so they can find answers that count, share information over intranets or the Internet, and build faster and more effective business solutions. Publisher 2000 is designed to take desktop publishing to a new level of automation, professional design and flexibility to allow you to work and publish the way you want. Publisher 2000 has expanded the quality and quantity of content, publication templates and design options to help users create and publish professional looking publications anywhere - desktop printer, copy shop, commercial printer and the Web.